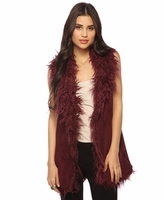 A longline faux suede vest featuring a faux fur trimmed collar and hem. Single hook-eye closure. Comes with a removable skinny faux leather belt. Woven. Medium weight. Fully lined. - Dry clean only; remove belt before washing.